The full moon day in this month is associated with the star “Krithika”. Hence it is called “Kaarthika Maasam”(Kaarthika Month). Matsya Purana is telling that if people can begin to build their houses it will be worthwhile. From Diwali Amavasya(New Moon day) to Kaarthika Amavasya if we light Diya(deepam) inside/outside the house, then it is very beneficial and brings good energy into the house. During these days, early morning bath is highly beneficial. 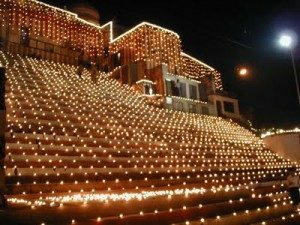 During this month people Kaarthika Purana every day. This month also has another name caled “Kaumudi Maasa”. Kaumudi means moonlight. In this month, people will not have much hunger. To avoid this problem, people observe Nakta Vrata. Since the day light is very less, people fast during the day and eat when the stars come out. Even during mondays or Poornima(Full moon day), people can observe this Nakta Vrata. In the evenings, just before it gets dark, lighting an oil lamp(Diya) with cow ghee is extremely beneficial. People do puja with bilva leaves to Lord Shiva and Tulasi(Holy Basil) leaves to Lord Vishnu. Bilva leaves signify the srishti, sthithi and laya. These leaves are very good in purifying the air and water. These fragrant leaves for medicinal purposes, including dyspepsia and sinusitis. The decoction of bilva patra(Bael Leaves) will energize the taste buds, increase our hunger and reduces symptoms of chronic constipation. If the roots of this tree are made into a concoction and taken along with honey, it can treat nausea and vomitings. If the paste of the leaves is placed on our eyelids, eye related infections will be gone. People say that it has the power of Sun. Sri Suktham is advocating that it has the power to remove the impurities of a person inside and outside. Particularly in this month, people perform puja with one lakh(100,000) or one crore(10,000,000) leaves. Usually, people recite 10th and 11th chapters of Bhagavad Gita. In this month, people eat their meals in the gardens(Vana Bhojana), cermonial sea bath(Samudra snana) and listen to the importance of this month. Donating to a good cause during this month is great way for divinity. During Sudha Dwadasi, Chathurdasi and Poornima days, it is preferable to keep the Diya in front of the house. Shiva’s abhishekam should be performed with only Cow Ghee. In Kaarthika month, usually people will not eat hing(asafoetida), onion, garlic, big cucumbers. Most people do not eat meat at all. On sundays, people do not eat Amla as well.